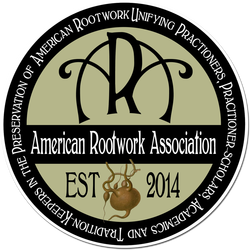 The American Rootwork Association (ARA) is an evolving coalition of practicing rootworkers, scholars, scholar-practitioners and tradition-keepers interested in formalizing the study of American traditions of rootwork, rootdoctoring and related folk traditions as serious areas of scientific and cultural inquiry. The ARA seeks to unify practitioners, practitioner-scholars and academics by raising broad questions, fostering the emergence of new areas of inquiry and examining the structures and conditions that influence rootwork as an expression of contemporary culture as well as its origins in African slavery and similar traditions in Native American cultures. ARA seeks to stimulate discussions that span the folk magic and folk traditions of the American South and beyond and to provide a home for emerging interests and ideas. The ARA publishes a peer-reviewed academic journal, Journal of American Rootwork, that addresses rootwork in contemporary culture, its expression on the internet, the history of rootwork in the context of slavery and beyond, and the teaching of rootwork, rootdoctoring and related folk traditions as formal areas of study. We wish to support anthropological approaches to the study of rootwork from all the subdisciplines: cultural anthropology, archaeology, physical anthropology, linguistic anthropology, medical anthropology, indigenous anthropology and others. We also intend to encourage and help provide avenues for enhanced communication among scholars, scholar-practitioners and practitioners sharing the interests of anthropology and rootwork. The American Rootwork Association (ARA) offers practitioners, practitioner-scholars, academics, researchers, linguists, archaeologists, anthropologists, ethnologists and anyone interested in the formal preservation of American rootwork and Southern folk healing and spiritual cultures a presence and voice in the discipline, allowing them to put their accumulated knowledge and insights to significant use. For the most current information on ARA-related activities, see the ARA pages on Twitter, Linked In, and Facebook, or see the blog page on this site!